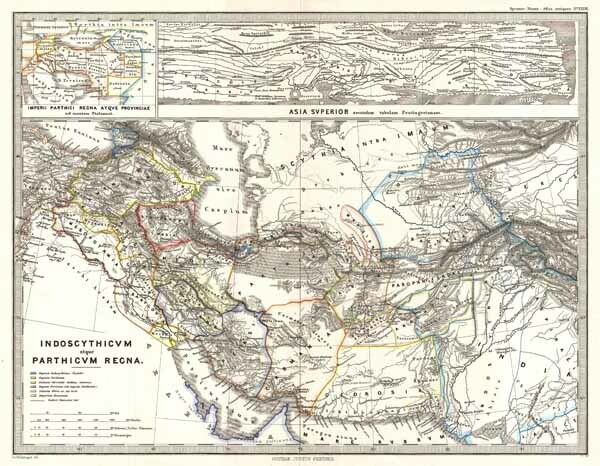 A particularly interesting map, this is Karl von Spruner's 1865 rendering of Persia in antiquity. This map covers the from Caucuses region between the Black Sea and the Caspian Sea, southwards to include the entire Persian Gulf, and eastwards as far as western India and Kashmir. These regions include the modern day countries of Iraq, Iran, Afghanistan, Pakistan, Kuwait, Armenia, Georgia, and Azerbaijan, as well as adjacent parts of Saudi Arabia, Turkey, and Kazakhstan. Like most of Spruner's work this example overlays ancient political geographies on relatively contemporary physical geographies, thus identifying the sites of forgotten towns and villages, the movements of armies, and the disposition of lands in the region. This particular example includes ancient names for many notable regions and historical sites. There are two important insets at in the upper quadrants of the map. THE larger of the two details this region as rendered on the Peutinger Table. Peutinger Table, or Peutinger Map, is named after Konrad Peutinger, who discovered it in 1508. An astoundingly important discovery, the Peutinger Table is today's only known example of a Roman era world map - though the map discovered by Conrad was itself a mediaeval copy of the Roman original. The second or smaller inset details this region according to the Alexandrian geographer Claudius Ptolemy. As a whole the map labels important cities, rivers, mountain ranges and other minor topographical detail. Territories and countries outlined in color. The whole is rendered in finely engraved detail exhibiting the fine craftsmanship for which the Perthes firm is known. Of particular interest to classical scholars. Rumsey 1626.028. Phillips (atlases) 3288. Espenhorst, J., Petermann's Planet, p. 397-404. Espenhorst, J., Andree, Stieler, Meyer & Co., p. 148.